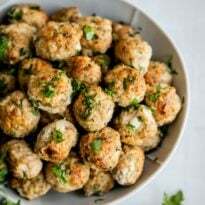 In a large bowl, combine ground turkey, bread crumbs, onion, parsley, eggs, garlic, Worcestershire sauce, basil, oregano, 1 teaspoon salt, and 1/2 teaspoon pepper. Using a strong spatula or your hands (I like to wear latex gloves), mix well. Shape the mixture into 1-inch balls (you should have around 48 total). Preheat oven to 400 degrees. Line a rimmed baking sheet with foil for easy cleanup. Coat a wire rack with nonstick spray and set on prepared baking sheet. Arrange meatballs on rack, brush with oil, and bake until browned with crispy edges, about 15 to 20 minutes (an internal thermometer should read 155 degrees for 15 seconds). Heat oil in a large skillet over medium-high heat. Fry the meatballs in batches until browned on all sides and the meatballs are cooked, about 5 to 7 minutes per batch (an internal thermometer should read 155 degrees for 15 seconds). Add more oil between batches if the skillet looks dry. Arrange in a single layer on a baking sheet, not touching. Freeze until solid, about 1 hour, then transfer to a freezer-safe container and store up to 1 month. Adapted from my Crockpot Meatballs recipe.